The United States Marine Scout Sniper School is regarded as the finest of the sniper training programs. The marine corps currently train their snipers alongside the sniper trainees from the Army and the Navy Seals. This is thought to keeps the marine snipers on their toes. Snipers who attend the Marine Corps sniper scout training school are taught in three different but equally important areas: These are marksmanship, observation, and stalking. Marksmanship refers to the ability of a marine sniper to hit his target, using his sniper rifle, consistantly from a great distance. The sniper practices this craft constantly in marine sniper school. The observation skills of a marine sniper must be perfect. This stands to reason, as a sniper spends most of his time looking, and only a few seconds shooting. The Marine Scout and Sniper School has developed a number of exercises to increase a potential marine sniper's observation skills. Stalking refers to a marine sniper's ability to close in on a target undetected. Marine snipers accomplish this by a combination of stealth and complicated camouflage with the use of ghillie suits. One of the main tools of the stalk is an odd looking suit made up of strips of canvas called a ghillie suit. 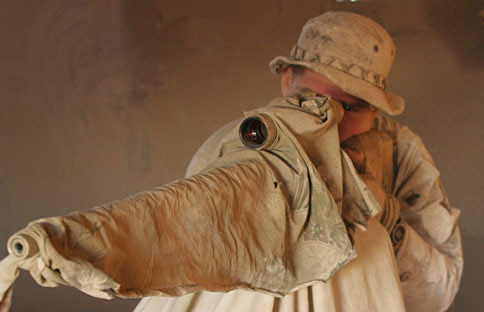 Marine snipers wear this suit on the stalk, and add bits of plant material as they go. This completes the illusion. The Marine Scout Sniper program lasts two months. In these two months, candidates obviously do much training with their rifles, but more time is spent in classrooms learning to discern range, windage, and theories of deployment, tactics, and barometric pressure. These classroom skills are easily as impostant as constant marksmanship training.